When David Chang can’t find the flavors he wants – like certain soy sauces from Japan – he makes them. Yesterday, he opened bottles and jars of what he calls “bonji” – fermented sauces – and “hozon” – fermented pastes- for us to taste. These fermented products, made from legumes and nuts, were developed in his lab in Brooklyn. The sauces had the color, viscosity, and meaty-saltiness of soy sauce, but each had a distinctly different base flavor, depending on the grain from which they were made. 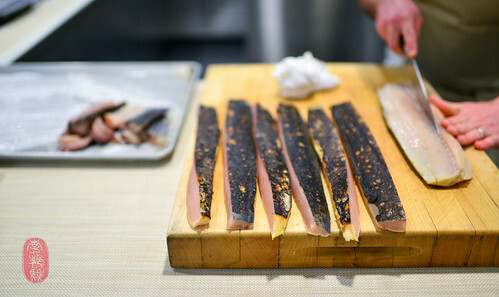 Last night, on the sixth night of the Twelve Days of Christmas at The Restaurant at Meadowood, Chang served a plate of cured mackerel – the skin seared on the plancha until charred – with puffed farro, radishes, and a hozon made from chickpeas. He finished the dish with a few drops of farro bonji. Based on an iconic dish that he serves at his restaurant momofuku ko in New York City, last night, Chang also presented us with lychees and riesling gelée, over which he snowed an avalanche of frozen and grated duck liver. It was surprisingly light, a refreshing mid-meal course to clear the way for the meat dishes. The duck liver paired amazingly well with the spot of Turley Wine Cellars “Salvador Vineyard” zinfandel, 2009 that Marty Winters, one of the sommeliers at The Restaurant at Meadowood, poured for me as a fun experiment (The Salvador Vineyard zinfandel was actually paired with the next course; Kostow’s poussin dish. The duck liver was actually paired with Turley Wine Cellars’ fantastic, rivalist white zinfandel). One of the most soulful dishes I’ve seen during this years Twelve Days of Christmas came from Kostow’s team last night: a roulade of poussin, stuffed with chicken mousse, truffles, and cranberries, served on a bed of broken rice porridge. John Hong, the sous chef who created the dish, finished it, table-side, with a pour of chicken broth that had been steeped with ginseng. 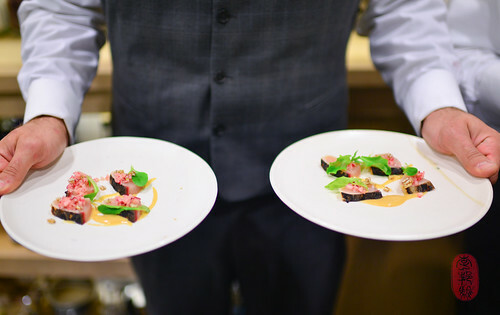 Kostow also served tender slices of abalone – wrapped and cooked in kelp – with grains and agretti. Over the top of this dish, he grated cured and smoked egg yolks. For dessert, Kostow’s team made confited persimmons in a syrup of piloncillo and served it with dduk (a type of Korean rice cake), persimmon sorbet, pecans, and a drizzle of maple syrup steeped with spicebush (to show diners what spicebush looks like, they put a stalk of spicebush in the carafes of maple syrup). The colors, the flavors, the aroma, the sentiment: wintry, Asian. 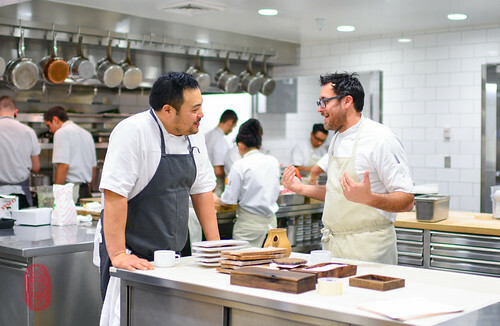 The entire menu from David Chang’s dinner, with wine pairings by the guest vintner Turley Wine Cellars is below, along with a slideshow from the sixth day of Christmas at The Restaurant at Meadowood. If you would like to see the photos in a larger size, click through the slideshow to the Flickr album. Lychee, pine nut brittle, riesling wine jelly. kale chips, lacto-fermented olive berry. Photos: A flat of greens at The Restaurant at Meadowood’s garden at the Montessori School of St. Helena; David Chang’s cured mackerel with chickpeas hozon; cured mackerel with charred skin; and David Chang and Christopher Kostow in the kitchen at The Restaurant at Meadowood. ~ by ulterior epicure on December 14, 2013.